8:33 pm, 27 September, 2014 р. Some how I deleted my address for the course for the sketchUp course and have not been able to get back on line except the first vidoes. 7:41 am, 29 September, 2014 р. If that is not what you are looking for write me at jpz@srww.com and I will help you. 10:13 am, 23 November, 2014 р. 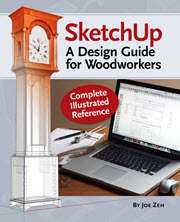 Are you going to update your basic and intermediate tutorials to the Sketchup 2015 release? 10:52 am, 23 November, 2014 р.
I have just created a one hour video called An Introduction to SketchUp Make 2015. 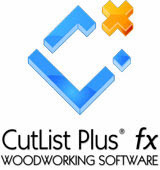 Popular Woodworking will be selling it as a stand alone DVD for $9.99. However, If you bought the Basic or Intermediate DVDs or downloads from Popular Woodworking you will soon be able to download that video free of charge. In addition, if you took the SketchUp Comprehensive course on-line Popular Woodworking will also be making it available free of charge. 2:31 am, 31 January, 2015 р.
I am going through your tutorial and got to the chapter on “Dimensioning, Scenses, and Layer Tool”. When I copy the drawer (twice) and put the copies in the “X-Drawer” layer, “hide” all of the other layers and make only the “X-Drawer” layer visible, the sides of the drawer are not visible. They are “there”, just not visible. They are their in the original drawer. They are visible in the “invisible” layer IF I include the “Drawer Sides” layer. I have been through several – maybe 10 or 12 – complete ‘rebuilds’ of the drawers and copies and etc without success. Is this a “known’ bug? I am about 99.44% certain it isn’t “operator error” as I have religiously followed – in quasi real-time – your tutorial. Your tutorial is very good, and I appreciate it. This is the first ‘snag’ I have hit. 9:14 am, 31 January, 2015 р.
I am answering you both here in email and also on the blog for the benefit of others. I suspect that some of the components you copied do not have all their primitives on Layer0 and that is what is causing your problem. If you can send me your .skp file I can tell you for sure if this is the case. 8:41 pm, 31 January, 2015 р. Just thought I’d add another diagnostic comment. I tried this with all of the other components, and each of them exhibited the same problem. For example, in the “aprons”, the tenons are visible but nothing else. In the “legs”, parts of the dovetails don’t make it into the copies. It appears that all of the “Sliders” make it to the copies. No part of the “Stiles” make it to the copies. I assume it has to do with “Layer 0” as you suggest, but since I never intentionally leave Layer 0, I don’t know how some of the primitives could have gotten “off” of Layer 0. 9:06 am, 1 February, 2015 р. Very common student problem with a very simple fix. Some where along the way some of the primitives for the sides were placed on the Drawer Sides layer. Interestingly not all of them. So I can’t tell you how that happened. But the solution is what I call the triple click test. Triple click on a Drawer Side (or any component). Look in the Entity Info box. If the Layer box says anything other than Layer0 use the Entity Info drop down to select Layer0. This places all the primitives back on Layer0. In your case the triple click test shows a blank in the Layer box. This means that the primitives are spread across more than one layer e.g. some on Layer0 and others on the Drawer Sides layer. I can’t tell you how that happened. But what often does happen is that a student uses the Context menu Explode command to explode a component and return it to primitives. When this is done all the primitives in that component are placed on the layer that its parent component was on before the explode. You must immediately put them back on Layer0. But if this were done your triple click test would have revealed a Layer box with Drawer Sides layer, not blank. In any case, simply triple click and use the Entity Info box Layer drop down to assign all primitives to Layer0. 9:19 am, 1 February, 2015 р.
I inspected some of your components and found that many had this problem. Do you have the Layers Management Tool installed and View/Layer0 Warning checked? It seems strange that not all primitives are on the same layer. For example, when I looked at the Front Leg I found that all the faces were on Layer0 and most of the edges. But some edges, particularly in the mortises, were on the Legs layer. You may want to choose each component and perform the triple click test just to be sure the problem is resolved. 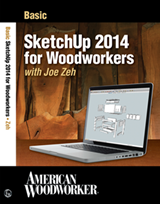 11:20 am, 14 April, 2015 р.
I wish to be notified when your Sketchup book will be available. 1:20 pm, 14 April, 2015 р. You will be notified through my newsletter. Thanks you for your interest.